In 2012 we launched the Mino-Niibi Fund for Indigenous Cultures, a regranting program to provide small grants to indigenous-led organizations in the Americas and the Pacific that are working to revitalize their own cultures, traditions, lands and livelihoods. These funds support work to document and preserve indigenous knowledge, revitalize threatened languages, protect native foodways and seed sovereignty, conduct youth-elder cultural exchanges, and empower indigenous women. The Mino-Niibi Fund is by invitation only. We do not accept unsolicited proposals. One of our grantees, Saphichay in Hauncayo Peru, honors and celebrates Indigenous Women and Indigenous Identity. This mural was painted by artists participating in the organization's annual festival "Kallpay Warmi" in 2017. Mino-Niibi means "good water" in the Ojibwe language. As a vital resource and powerful spirit, we see making small grants as an honorable and life-affirming process, like sharing good water with others. Our grantmaking philosophy is rooted in the fact that organizations and movements that are created and led by indigenous peoples are best placed to envision, articulate and implement their own plans for the protection and revitalization of their communities and landscapes. We hold reciprocity central to all our partnerships; including reciprocal learning, sharing and respect. The Mino-Niibi Fund helps connect our grantees with one another, other like-minded organizations doing similar work, and additional sources of support and funding through our emerging Te Ha Alliance for indigenous solidarity. Sacred Fire Foundation participates in the Mino-Niibi Fund as a co-funder. The Cultural Conservancy (TCC) is thrilled to support these 2017-2018 Mino-Niibi Fund grantees. We have awarded fourteen grants serving indigenous-led groups in ten countries. 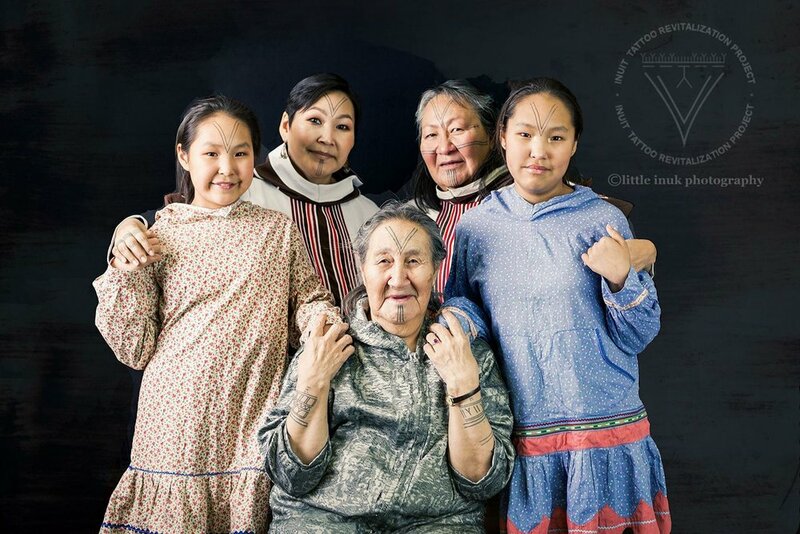 For cultural revitalization through the artistic tradition of Inuit facial and body tattooing, Inuit traditional and contemporary tattoo artists are collaborating with photographers. Each tattoo and line possess specific cultural significance, and much of this knowledge is rapidly disappearing. This project includes women Elders and focuses on the empowerment of young women, the whole community, and feeding their passion to bring their cultural traditions back to life. To protect their rights and lands, BCLN is taking the governments of Canada and the province of Alberta to court. This grant supports the Community Video Interview Project which will play an important role in BLCN’s upcoming Tar Sands Trial. It will feature 15 video interviews with Beaver Lake Cree community members, which the legal team will use to help the Court to see, hear and understand how BLCN’s traditional way of life has been impacted by industrial development. We support the construction of the “Dragunan Utapa” (The House of the Dragon and Cultural Center) which is in its final stages of completion. When fully functioning, the center will be a shared, physical space that will serve many purposes, such as a place to exchange and demonstrate traditional knowledge, food and farming traditions and arts. The center is at the base of the Sleeping Dragon sacred site. It will serve as a model of a structure that fuses traditional building systems with contemporary and sustainable technologies for the surrounding communities. We support the Astronomical and Biological Ancestral Project: U wach Ukaj U wach Ulew (An eye to heaven, an eye to the earth). Through the eye to the heaven component, students will learn about the 13 stellar constellations outlined by the ancient Maya codices and their relationship to the solstices, equinoxes and the agricultural cycles. Through the eye to the earth component, the school will purchase microscopes so that students can learn about the micro universe and understand how ancestral practices are science applicable to this time. We are significantly expanding the impact and reach of educational materials and workshops focused on the agricultural cycle, agricultural rituals, control and prevention of diseases in animals, plants and people from traditional knowledge as well as help solve other community needs. The materials distributed include calendars that show the agricultural cycle and audiovisual media, books and brochures created with the communities. We support the teachers at the Kusi Kawsay Andean School where elementary school students learn, understand and celebrate their Quechua tradition and culture according to Andean Cosmovision. They participate in cultural events in relation to the Andean Calendar with traditional clothing, dance and song and produce art and textiles in the spirit of their culture through the guidance of their Sacred Geometry. This wisdom gives them values and skills such as cultural pride, respect, love and reciprocity, self-esteem and empower them to be self-assured young leaders and change makers. We support a Council of Elders and regional gathering between Indigenous elders and knowledge holders from 13 different communities in Colombia and Indigenous students enrolled in the Degree in Pedagogy of Mother Earth at the University of Antioquia. The purpose of this gathering is to create a space to nourish, revive, and protect ancestral knowledge and cultural practices and create dialogues of knowledge and exchanges that allow participants to restore the ancestral and collective memory. This project seeks to generate critical, spiritual, and pedagogical spaces to help solve the problems faced by the participating communities. We support an audio-visual intercultural collaboration between lowland rainforest Indigenous communities on the Amazonian and Coastal sides of the Ecuadorian Andes. The Selva Producciones Team (Sarayaku Community of the Kichwa People, Canelos Canton, Pastaza Province) will share their experiences of using audiovisual tools to strengthen their culture and protect their territory with the youth of the Guadualito and La Chiquita community members (Awá and Afro-descendant Peoples, San Lorenzo Canton, Esmeraldas Province). Together they will create a short documentary video that depicts the Esmeraldas ancestral communities' struggles against surrounding oil palm companies that are poisoning their waters and foods. We support educational workshops and community events to re-awaken and re-connect Quechua youth and families to their indigenous roots, traditions, and values. 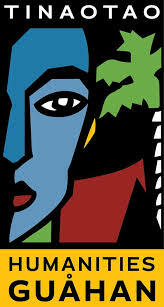 Their Kallpay Warmi (Strong Women) annual festival honors and celebrates indigenous women and indigenous identity. Saphichay focuses on the renewal of positive indigenous identity to improve community health and well-being. Sna Jtz'bajom Cultural de los Indios Mayas A.C.
We support the organization's Tseltal-Tsotsil Mayan Language Reading and Writing School in "Chanob Vun Ta Bats'i K'op". Through a participatory methodology, the school teaches Maya Language to children and youth, integrating ancient knowledge with the perspectives of people from the community. They integrate traditional stories, sharing knowledge as herbal medicine, clothing, dance, music, traditions etc. with aspects of participation and construction of learning for life. At the end of the workshop, students write a story/ fable, based on the transference of knowledge through oral tradition and the reality of the community. We support the Our Mother Moon project to research, protect, and appropriately share indigenous knowledge of various themes related to the Moon to animate ancestral wisdom and practice for the wellbeing of women and their communities. 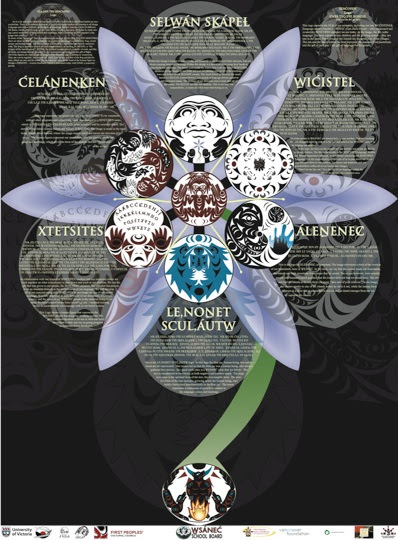 Through intercultural collaborations including Maya, Pueblo, and Zapotec young women and elders, they hope to nourish unique female attributes connected to the Moon in the context of lunar astronomy, calendaring, fertility, midwifery, weaving, natural pigments, and plant medicine. We support Halau Kaeokahelelani, a school of Hawaiian Culture, rooted in the foundation of ALOHA where students learn the fundamental cultural teachings through the lifestyle of hula, language, music, arts, land stewardship and ancestral connection. The property where the school is located, has a fruit orchard that covers 3.5 acres of the 6 acre property they lease. The orchard has more than a dozen varieties of fruit trees. The students and families will learn how to care for the trees, including cleaning and pruning as well as tending to the soil. The community will learn about the fruits, how to eat them as well as their health benefits. This project brings back self-reliance among families and understanding that if one takes care of the land, the land will take care of us. We support the development of an educational and cultural teaching/learning multi-media program that will illuminate Hawaiian cultural values, practices, and knowledge derived from the experiences of Polynesians as they voyaged throughout the Pacific Ocean to settle the islands of Polynesia (including Hawai’i). The project will digitize or virtualize Namahoe (the 72 ft, Hawaiian voyaging canoe), so that anyone interested in learning about their canoe, especially the youth of Kaua’i, can familiarize themselves with the different parts of the canoe, including the English and Hawaiian terminology associated to these different parts of the canoe. In this way, during actual visits of the canoe, students are then able to apply the learned knowledge and connect to the vessel on a deeper level. We support the Ko te awa ko au (“I am the River, and the River is me”) Delegation project, including an indigenous-led delegation and exchange of Native American leaders and Maori leaders in New Zealand to create a report and video of the historic (yet little known) 2015 Maori Whanganui River agreement recognizing the sacred water system in law. This agreement has the potential to change the way sacred sites and watersheds are protected around the world. 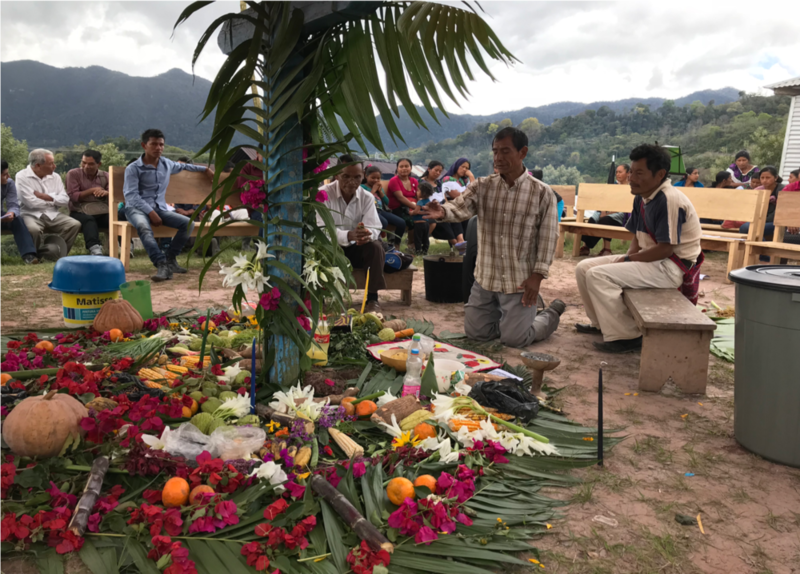 This indigenous exchange helps Native leaders better understand the water rights process, the learnings and roadblocks encountered, and ways to strengthen indigenous communities and the entire Rights of Nature movement. We support Te Wai Project – Marae Waterways Pilot. This project focuses on the preservation of traditional stories and information from six Waikato-Tainui Marae and their waterways including rivers, streams, wetlands, lakes and underground aquifers. This research focuses on Waikato-Tainui marae-environment relations, and the duties and responsibilities that are bound by customary obligations to people and place. The focus of the research is aligned to the protection of tribal identity and integrity as is outlined in the tribal development strategy Whakatupuranga Waikato-Tainui 2050. Click on above markers to learn about some of our grantees. We supported this organized 40-day indigenous walk from El Salvador to Chiapas, Mexico with the purpose of bringing together communities divided by political borders to share and learn from each other, build cultural and spiritual alliances and raise awareness about the current threats and destruction of sacred sites by mining and development. We supported educational workshops on: recuperation and valuing of crops and diversity that demonstrate capacity to adapt to climate change, and workshops on recuperation and participatory valuing of ancestral techniques to minimize the risks of climate change. Conduct in depth interviews with knowledge holders, through a semi structured guide, around the knowledge, practices and biodiversity that adapt to climate change. Elaboration of materials for outreach and education to rescues and spread the knowledge, practices and biodiversity that adapt to climate change. Registration with INDECOPI of the knowledge and practices to adapt to climate change. We supported the Ayoreo Women’s Weaving Bank project by training and building the capacity of Ayoreo women to market their traditionally designed hand-woven bags using rare Native plant materials and dyes. This project provides recently-contacted Ayoreo women with economic alternatives to prostitution and other dangerous work. This year two Ayoreo women presented their work and sold-out their beautiful bags at the International Folk Art Market in Santa Fe, New Mexico. We supported the coordination and planning for the 2016 “Prayer for the Seeds” Journey and run through the Americas in honor of the prophecy of the Eagle and the Condor and to build indigenous solidarity. We supported the “Nsyilxcen Audio and Video Collections Rescue Project” to acquire reel-to-reel video playback equipment and train En’owkin staff to digitize and catalogue vulnerable audio and video tapes of Okanagan Nsyilxen language speakers to use in language programs. We supported Nenqayni Ch’ih Yaltig ‘We Are Speaking in Nenqayni Ch’ih.’ The Tŝilhqut’in language is on the critically endangered list with fewer than 100 fluent speakers remaining. This project encourages adult speakers to teach children and youth how to speak the language using everyday conversations by creating a phrasebook with accompanying audio and video files. It records live conversations in the language on as many topics as possible covering events and activities during all seasons including basic household discussions to on-the-land activities. Audio recordings will be included with basic language terms listed in the “Nenqayni Ch’ih Yaltig ‘We Are Speaking in Nenqayni Ch’ih’”new phrase book. We supported “Reclaiming ȾIKEL” for the ecocultural revitalization of their ancestral place ȾIKEL, a wetland, and the traditional plant called SX̱ ELE,IȽĆ, a type of willow, along with the traditional knowledge associated with this place and plant. This project engages Elders, community leaders, youth, and restoration ecologists in restoring the health of the site and engage in traditional gathering of their culturally important plant, including applied use of their SENĆOŦEN language through school field trips and intergenerational learning processes. In 2016 this project was co-funded with the Sacred Fire Foundation. The Guam Humanities Council is a small, independent non-profit organization that provides foundational support and educational resources for the people of the Pacific Island of Guam through the public humanities in order to foster community engagement and dialogue, inspire critical thinking, celebrate diversity, and enrich the quality of life of island residents. Throughout its long history as a U.S. territory, Guam has experienced great environmental change that has altered much of its historical, cultural and natural landscape, and transformed indigenous knowledge and skills associated with local food production and consumption. This grant supported the Guam Humanities Council's 'I Tano yan I Tasi' project, which seeks to promote literacy around the principles of ecology and sustainability, and to explore the important connections between food, health, culture and the environment in order to better “grow democracy.” Funds were used to support the participation of GHC in the 2013 Bioneers conference, where they gave a presentation about the traditional cultural and ecological knowledge of the Chamorro people, and how it has changed and been reclaimed over a century of colonialism and militarism in Guam. We supported “Lāʻieikawai,” which provides access to quality indigenous-created live Hawaiian language theatre for communities outside of the urban core of Honolulu through performances at Hawaiian immersion schools and for the general public on neighbor islands. We supported Lonoākea, the Communications and Documentation Project of Nā Kālai Waʻa (NKW). This project implements and strengthens the NKW vision of He waʻa he moku, He moku he waʻa, “The canoe is our island, and the island is our canoe,” and uses multimedia to document the 20 years of our deep-sea voyaging canoe, Makaliʻi, and her voyaging traditions. Many hula (dance) and oli (chant) have been written for the double-hulled canoe Makaliʻi. The hula and oli tell her story. 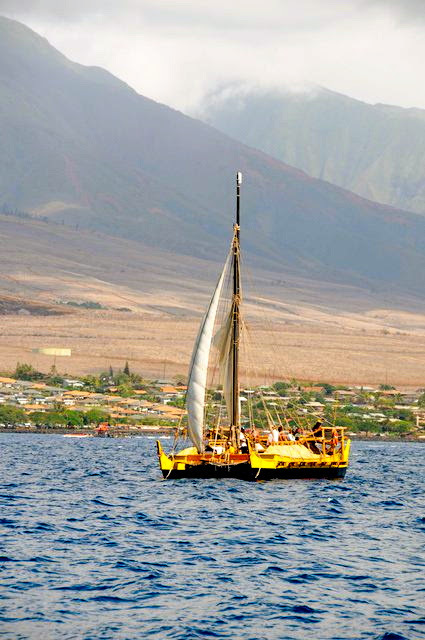 They provide explanation for her existence, stories of people who built her and sailed her as well as her travels throughout the Pacific, and the link to ancient waʻa traditions. Pou Kapua Creations Trust energizes, ignites and empowers traditional knowledge holders, educators, practitioners and artisans from the Pacific and around the world to come together and collectively expand our horizons of learning and practice. By incorporating aspects of teaching and learning, inspired creative design and sustainable social entrepreneurship, Pou Kapua assists Pacific and Indigenous peoples in their fight for recognition, human rights, cultural restoration and self-determination. This grant supported Pou Kapua in their work with Pacific Indigenous peoples in reviving traditional knowledge of language, symbol, carving, and canoe-building. Activities included the production and exhibition of environmental awareness materials in the Pacific, participating in Pacific Voyages, and the development of HAKAMANA: an Indigenous Evaluation System. We gratefully acknowledge our generous funder, Tamalpais Trust, who has enabled us to establish this indigenous-led global re-granting program and support its growth. We also acknowledge support from other funders that have helped expand this program: the Lush Charity Pot, Swift Foundation, and NoVo Foundation. We are deeply grateful for these philanthropic partnerships to support Indigenous rights and eco-cultural revitalization.